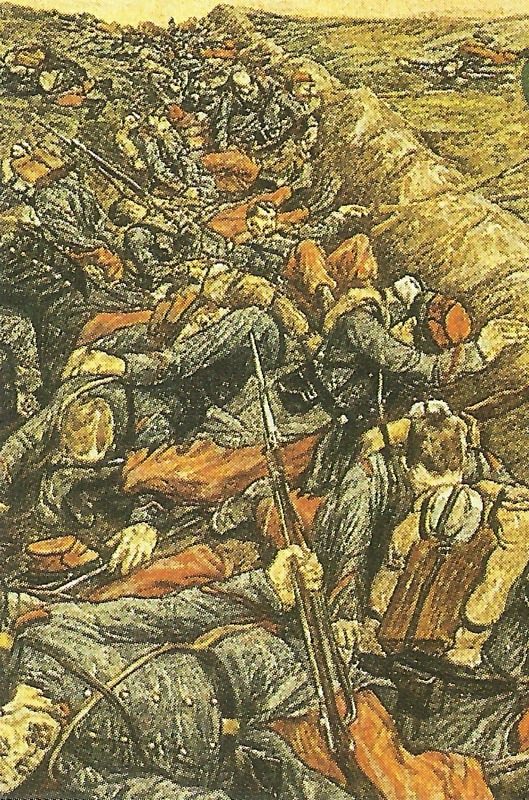 Killed French soldiers in their trenches. Argonne: Unsuccessful German attacks at Marie­-Therese and La Fontaine-aux­-Charmes, more Argonne attacks fail on August 13. Western Russia: Dvinsk evacuated but Russians retake Kovarsk and Toviamy south-southwest of it next day. Austrian Neue Freie Presse on Italian Front ‘The enemy knows how to look death in the face … Bersaglieri … fought until the last man had fallen’. Cameroons: 5th Indian Light Infantry (595 soldiers) arrive at Duala. South Tunisia: French garrison again reinforced, totals to more than 3,000 soldiers, 13 guns and 6 MGs. Adriatic: Austrian sub U12 sunk (1 survivor) by mine off Venice. Channel: HM Special Service smack GRE sinks coastal submarine UB4 off Sussex coast.